Since the beginning of time, various peoples have known the power of symbols, geometrical forms and figures. Indeed, not only their force, but also the energetic vibration which they produce! And so it was in Atlantis, the legendary continent of olden times. Atlantis was destroyed, it is said, due to experiments with and the misuse of powers, and groups of inhabitants fled to other continents. The Atlanteans arriving in Egypt brought the Atlantean Cross and the knowledge of the effect of this geometrical form with them. They used it for protection and healing purposes. The Egyptians were always in need of political power and strength. Egyptian heiroglyphics and temple decorations show that the Egyptian aristocrats changed the two-legged Atlantean Cross into the one-legged Ankh! There are pictures to show the different crosses displayed in museums. 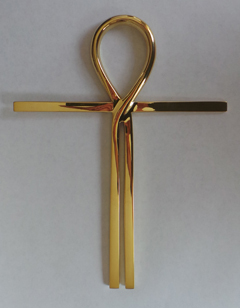 The ankh has a distinctly different vibration to the Atlantis Cross. It was used to exert power, and this not only in a positive way. Whereas the base of the ankh radiates with the rather dangerous energy of Green Minus (negative green), the two legs of the Atlantean Cross send out the balancing rays of black and white. Negative green is a force which can be used for weakening effects. Both the Atlantean Cross and the Ankh oscillate with Green Plus (positive green) at the top, violet towards the East, and red towards the West. The Atlantean Cross is a sign of life, of balance between feminine and masculine energies, and of connection between the Earth and the Sun. 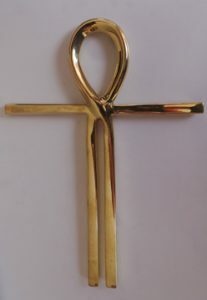 In contrast to the ankh, the Atlantean Cross is purely strengthening in its function. When the Atlantis Cross is worn as an amulet, it strengthens the persons vibration and provides powerful protection against external influences. The polarisation of the Atlantean Cross should be observed. *A pendulum can be used to check which side should be facing outwards. The cross is equally effective whether it is worn covered or uncovered, whether made of gold, silver or brass. The larger the cross, the more effective it is. The Atlantean Cross can be used as an energy pendulum. For this purpose the small cross is suspended by a cord and the large one is held on the middle finger. The middle finger should remain in contact with the thumb, thereby forming a figure eight – the symbol for eternity – with the loop of the cross. Women should use the left hand and men the right hand. The large Atlantean Cross is used as an energy generator, and is an extremely powerful instrument in balancing and harmonising subtle energies. If laid on the floor, the large Atlantean Cross affords excellent protection against negative psychic influences, particularly when aligned using a pendulum. When hung on the wall it radiates in one direction so the polarization should be checked. You can check this with a pendulum. Other possible applications are to be found in the workplace, under the bed and in healing. The Atlantean Cross strengthens your energy field, making it immune to weakening and unstable vibrations from other sources. Even children have a natural enthusiasm for it and enjoy wearing this amulet. The Atlantean Cross is a very useful tool in harmonising negative energies around persons and places. 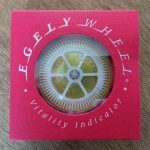 It is put to good use in dispersing negative psychic influences. When you feel an unwanted presence or threat from some source, you can protect youself as well as others. Therapists find that their energies are not so drained and protection can be extended to those in close vicinity. The Atlantean Cross also works at a distance and since psychic forces can act from afar, anyone sensitive to subtle energy fields and psychic influences would benefit by keeping undesirable vibrations away. * The process of tuning with a pendulum is not essential as long as the right intention is used to activate protection. The orientation of the cross is not critical when kept on the person.